With the three day weekend came a little extra time for fun. On Saturday, with friends in tow, we headed out to Leesburg and Lucketts, Virginia to try our shopping luck. This area, roughly an hour from our house, is a veritable treasure trove of home decor and second hand items. We've found interesting and unique items for our home in the past, and this weekend was no different. We started our day at the Old Lucketts Store, perusing their outdoor selection of goods, housed in open vendor tents. I was immediately drawn to this old, rusty and crusty stool. 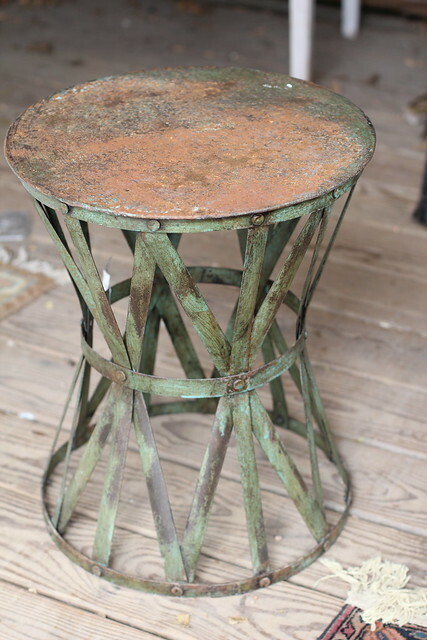 The patina on it is absolutely great and would make it perfectly suitable as a nice outdoor item or in a rustic decor settings. However, after a bit of clean up, and maybe a fresh coat of bright paint, it could be the perfect petite overflow seating addition for any room. 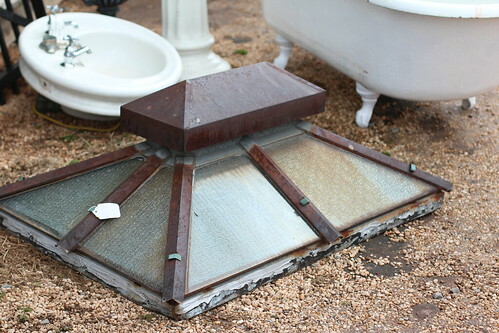 We also took a moment to stop and admire this cool, old sky light. They don't make them like they used to, that's for sure. I also thought the beautiful rounded shape of the pedestal sink with fluted base (in the background) was positively dreamy. Just outside of the front steps we saw these old metal boxes. I don't know if it's the weather or season, but there's something about this rustic patina that was particularly appealing on this trip. ...I couldn't help but take pause when investigating this unique industrial looking item. For starters, it's from our hometown of Cleveland, Ohio. But my immature 12 year old sense of humor was amused to say the least, and thought it might be perfect for a man cave. Here's a closer look in case you missed it in the photo above. After I collected myself, the four of us headed inside for a look around. 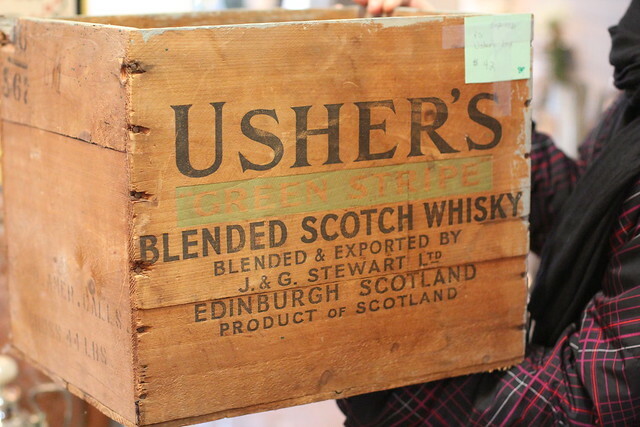 One of my favorite items of the day was this old wooden crate, once used to ship and store whiskey. I thought it could be a really unique magazine rack, or even act as a unique method of toy storage for those with small kids or spoiled pets. Sadly, I couldn't convince anyone in our group to take it home. 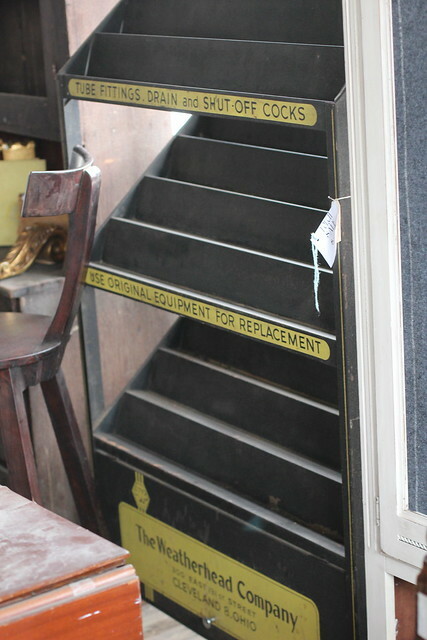 There was one rather amazing item in the Lucketts main house that isn't for sale. In all of the times we've been through their store this is the first time we've noticed this gorgeous built-in buffet with pass through to the adjacent room. I think this is just the first time this room has been empty enough for us to see it. You can definitely see just how cool this place was when it was a house once upon a time. We just might have to use this as inspiration somewhere. 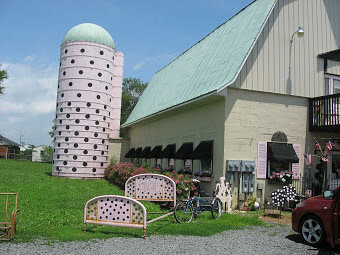 After leaving the Old Lucketts Store, we headed down Route 15, and stopped at another antiques store, On a Whim, that is widely recognized by its old silo, painted pink with black polka dots. 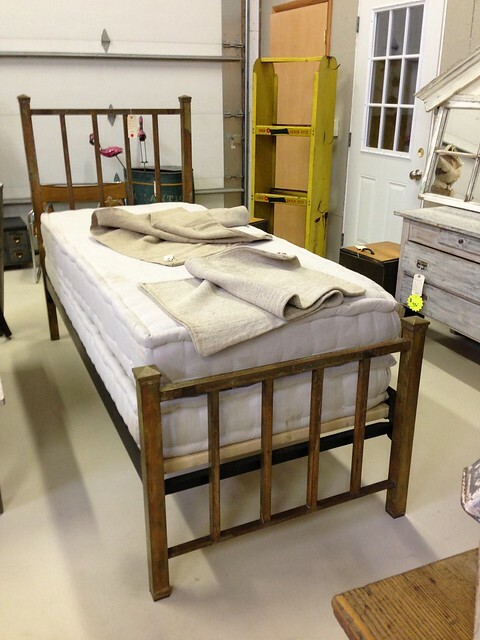 We took some time to explore the rear shop, and I practically fell over when I spotted this gorgeous brass bed. The tag read that it had been discovered at a French flea market, and if only we had room in our home, this gorgeous bed would have come home with me in an instant! 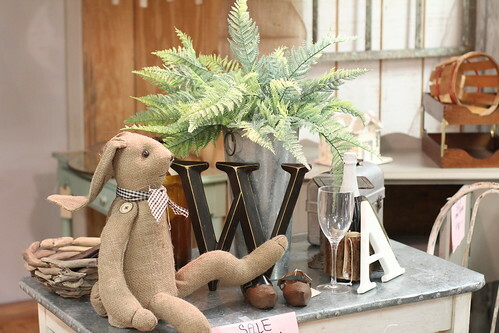 Finally we headed into the main store, and I immediate spotted this cute vignette. It called out to me, primarily because both my and Alex's first initial were represented. It's almost as if the shopping gods knew we were arriving, and were letting us know good things were in store for us. 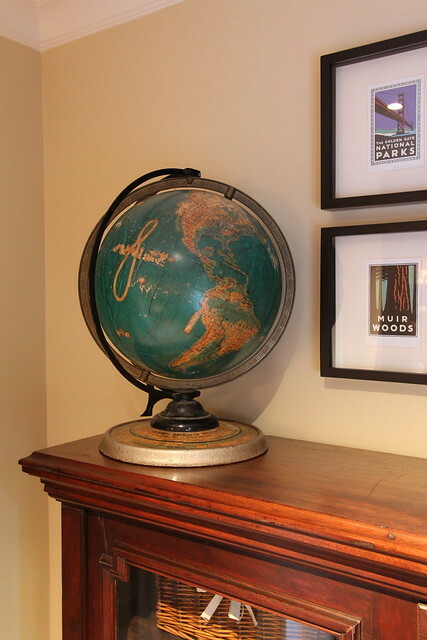 I was immediately drawn to a globe at the top of store's stairs because of the unusual shade of turquoise and its fantastically detailed base. This globe has obviously been around the block, and its peeling and stained surface gives it a patina that you just can't find with new items. So what did we bring home from our trip? 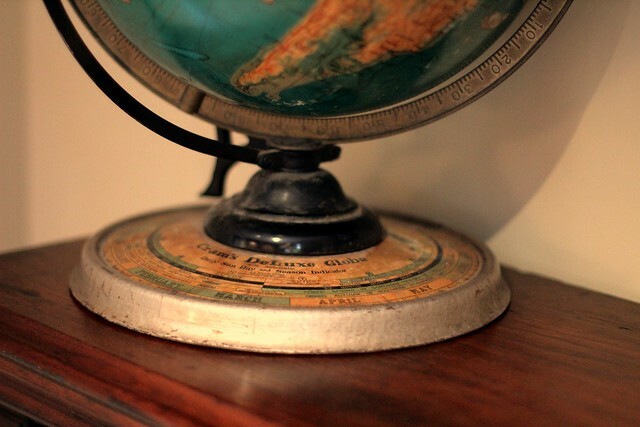 Although there were many items that we loved and admired, we came home with just one special addition -- the antique globe. We found the perfect place for it too, as it proudly graces the top of our antique bookcase in the office. Not too shabby. Well, a little shabby actually, and that's why we love it. As I mentioned the base of the globe is one of the things that really caught my eye, and I think you can see why. After we put it in the office Alex said "You know, I've wanted to own a globe ever since I was a little kid, but I never did. 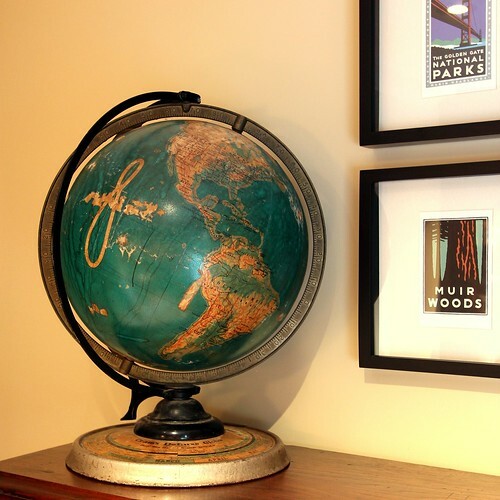 Now I finally have a globe." I'm happy I could make one of Alex's dreams come true with a cool piece of decor. I also think he might have been a little bit of a weird kid. Did you bring home anything fun this weekend? 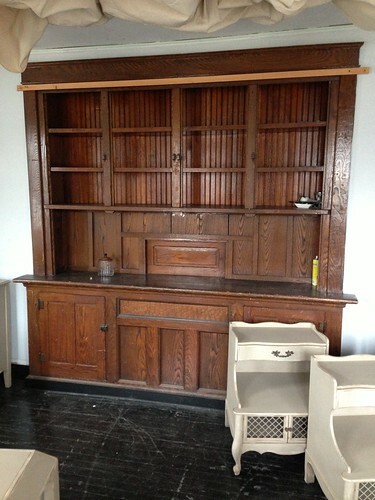 When you go shopping do you like to look for clean and new, or old and crusty? I know it's a major personal preference, and my tastes have changed over the years, so I'm very interested in your tastes. Crusty old crates are the best. We have a few soda crates in our house -- one for small books and another for mail and magazines. I'd take that whiskey one in a heartbeat! I have an identical (full) brass bed! I got it at an antique shop here in Colorado! You have a great eye! I have to tell you - kind of funny - when I first spotted the picture you posted of the Stokholm map (was it on Facebook or Instagram?) I thought it was one of Wendy's baking creations that went all wrong. What can I say? Phone screens plus bad eyes make for these sorts of misunderstandings. Now I have to go read the Volvo story. Can we go shopping together? I swear I live for this stuff. I totally would have taken the boxes home. And the crate. Possibly more. Sounds like fun, Alex. I love shopping with people who can make a decision and enjoy the process too! The round sink with the fluted pedestal is almost identical to the one we have that is going into our second floor bath. The globe is a neat find. Any idea how old it is? This weekend we scored two identical corner china cabinets for our dining room. They look to have been made around 1900 and have about a dozen coats of paint on them, so stripping them off is going to be fun. We also picked up an antique wood-works clock made by Jeromes and Darrow (they built clocks from 1827 through 1832, so it's at least 180 years old!). If you ever go picking in central or eastern VA, we have a few favorite spots to share with you! I'm so jealous that you're installing a sink lookalike. Gorgeous! 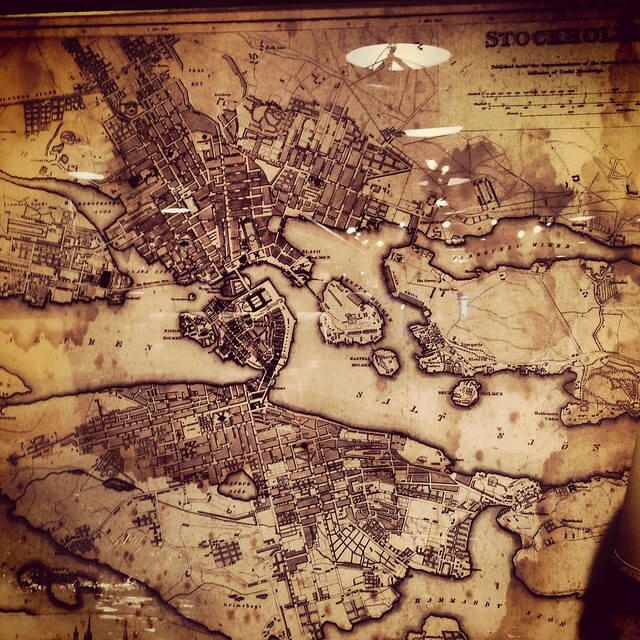 I'm not sure how old the map is, but there's a 1936 copyright date on it (not that this means much). We'll have to do a bit more research. 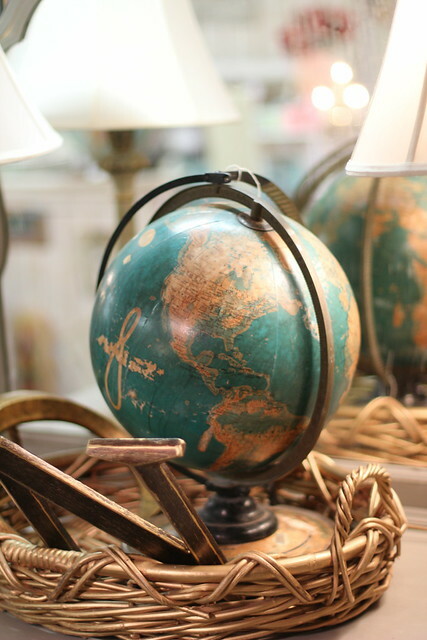 I found a few similar looking globes today in online antique stores, and from what I can tell, I scored a pretty great deal. Good luck stripping your new china cabinets, and we'd love to take you up on your offer of sharing your favorite spots with us. We're always looking for new places to explore! Nice find! Sounds like the four of you had a really nice day. 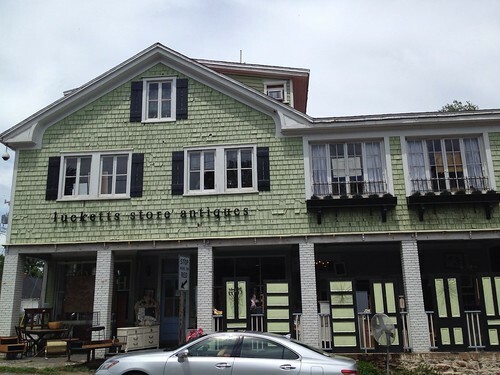 Lucketts is a great place to shop, but(believe it or not) it was a lot more fun a few years ago ... before the fad of Paris apartment and fake-shabby-vintage took hold. The room with the built-in hutch had a great dealer in it at that time. 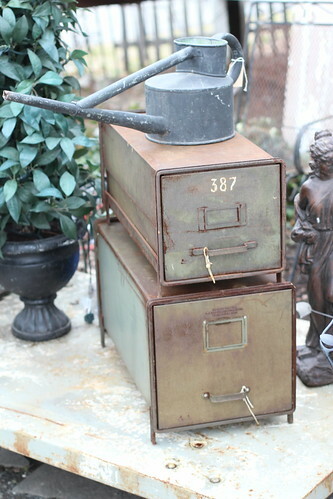 I still love Lucketts to look and to shop, but I find that I am tempted to bring home a whole lot less than I once was. A co-worker tipped me off to a great place in Frederick. We'll have to explore that area soon as it's been a while. That's so great Shelley Hanson Strickfaden! I bet it's a beauty! The globe is a beaut. I love looking for the old and crusty stuff, too! I try to focus on finding something with meaning to us. i.e. "Kid" Alex and the globe. Recently, I grabbed a milk glass-eque vase that is a near exact replica of the vase my dad gave to my mom upon giving birth to my sister. At the same stop, I also found an old soda shipping crate with my hometown stamped on it. 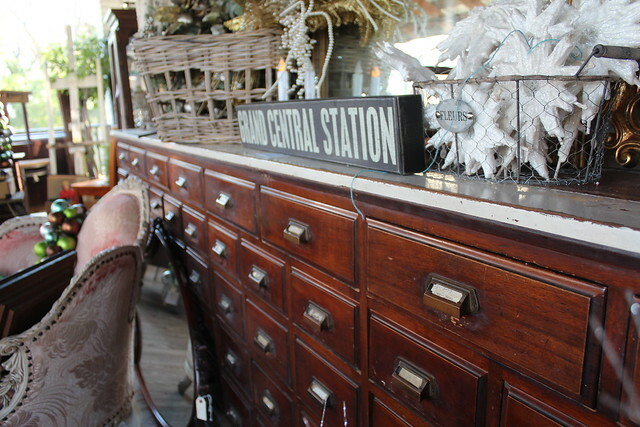 I could seriously spend hours in places like the stores you've featured. Great post! I think we're kindred spirits, Amanda. :-) I love that you found the milk glass and old crate that had such a special meaning. It's touches like these that really make a house a home, right? Congrats on the Old House Journal cover and story. I was still awake at 3am last night so I turned on the light and grabbed my new issue of OHJ and there you were with your doggie.